These larger silicone breast forms - the Envy Be Mine Breast Forms - are some of the better we've seen. Their big size would normally be too heavy, but because they are affixed to a full vest, they feel comfortable and sit firmly on the chest. But because they are large, you also get a great jiggle. Another nice thing about having these breast forms so firmly affixed to you is that they allow you to engage in almost any activity without worrying about them falling out or falling down. The back has an adjustable adhesive back enclosure which makes it relatively easy to cinch up and close. It will also close tightly and without ungainly straps hanging abound so you can wear these breast forms under a wide variety of clothing. The Envy Be Mine Breast Forms are made of medical grade silicone. 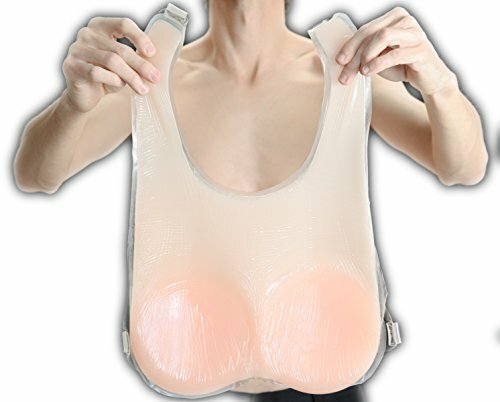 This is the same basic stuff that actual fake breasts are made of so you get a great, hyper-realistic feel to them. They are size 44DD but will fit in Bras sized 42DD / 44DD / 46C. They weight about 4 pounds and they really look and feel like real breasts. These are great breast forms.